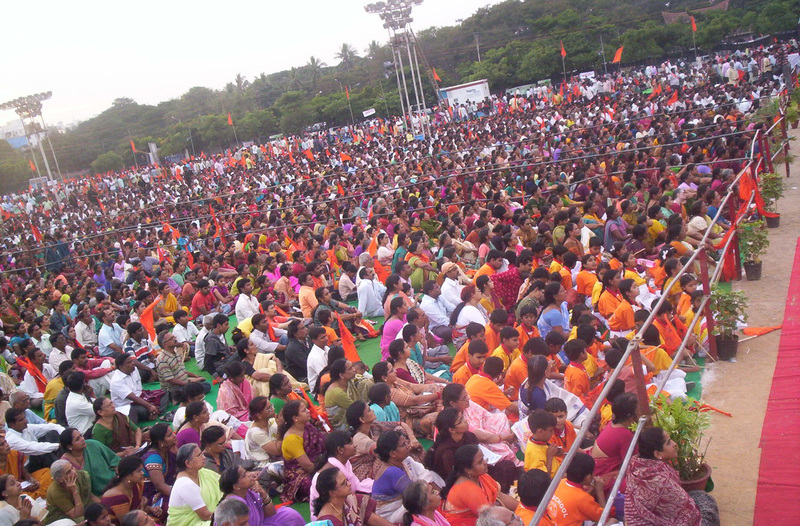 27th November , 2010 was a historical day in the history of Bhagyanagar ( Hyderabad ) with over 45,000 Hindus coming together to chant the "Hanuman Chalisa" at the NTR Stadium from 5 pm to 7 pm. This was part of the Hanuman Shakti Jagaran programs being run across the country. It is historical because the Bhaktas who came, did not come there to chant the Chalisa to seek some personal material benefit but because they came there to seek Hanuman's divine powers to ensure the smooth completion of a grand Ram temple at Ayodhya. The program was blessed with the presence of Pujya Sree Ramanuja Chinna Jeeyar Swami, over 40 sadhus and sants of various maths and sampradayas, Sri Ashokji Singhal of VHP and Sri Bhagayyaji. Sri Ashokji Singhal threw light on the overall issue of the Ayodhya Ram Mandir and the current status. Pu. Chinna Jeeyar spoke about the need for Hindus to be assertive and not be cowed down when their religion is under attack. He also spoke about the value system that Sri Rama stood for and wanted each one of us to aspire to walk on his ideals. During the Kumbh mela, the sadhus and sants announced that Hanuman chalisa must be chanted by all Hindus with the sankalp to build a Grand temple at Ayodhya for Lord Sri Rama. For the last 3 months, the chanting at homes started and the first positive step was the court judgement that the birth place of Sri Rama is not disputed. However, some more clauses have been added in the judgement which act as obstalces to building a Grand temple. Moreover, the Muslim leadership does not seem to have seen the spirit of the judgment and are insisting on not giving up the land. Our conviction is that these obstacles will also go away…. 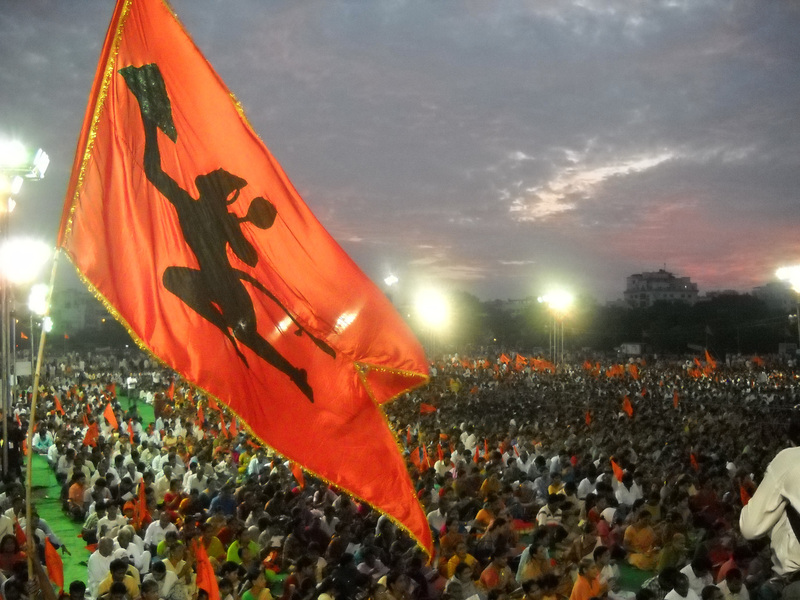 For the last one month, the karyakartas of the Hanuman shakti Jagaran Samiti worked day and night contacting lacs of homes in the twin cities of Hyderabad and Secunderabad educating them about the Ram temple issue and asking them to chant Hanuman chalisa at their homes. Lacs of Hindus participated in chanting of Hanuman chalisa everyday in their homes and came together as part of the Lakshagala Archana program. There were last minute issues by the Hyderabad police who tried to stall the program. Two days before the program when the construction of stage was to be done, they said that we cannot give permission and the program cannot be held. The pretext – ” Dec 6th, is coming near and there could be problems”. This when the information has been given to the police so many days in advance . It is strange that the same police does not stall any programs of Majlis Ittehadul Muslimeen ( MIM ) or any other Muslim program. The Samiti had to then move the court and the High court came down heavily on the police that protecting law and order was the duty of the police and what is wrong in having a program within a ground. Thus, the permission for the program was got but with the directive that we must close the program by 7 pm. It is ironical that the MIM organised a program yesterday on the Ayodhya verdict issue from 8 pm onwards upto midnight and why the Hanumat Jagaran Samiti was restricted to 7 pm is a matter of concern. Is it because the MIM holds 7 MLA’s and is the Dy.Mayor of Hyderabad. How can there be two rules in the same city for different communities ? Anyway, when the Paramatma is with us, obstacles fall away and thousands of families and youth fired with the spirit of “Vajrang Bali” encompassed the NTR stadium. Cutural programs included some wonderful songs and a beautifully choreographed dance sequence. The roars of Jai Shri Ram reverberated and set the tone for the sankalp that we will ensure the successful completion of a Grand temple at Ayodhya for Sri Ram. 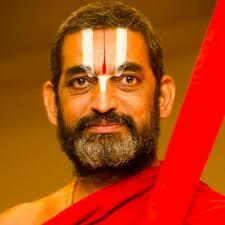 Chinna Jeeyar Swamiji ended his speech with a poignant prayer for Ashokji Singhal. He said Ashokji has given most of his life for this movement and sought strength for him to see the successful completion of this movement. As per the samiti, Hanumat Shakti Jagaran programs will be held at all Taluka Headquarters across the country in the month of December as a reminder to the government that Sri Rama’s temple still remains at the core of the desires of crores of Hindus across the country. This entry was posted in Hindu Dharma, Nation and tagged Ayodhya Ram Mandir, Chinna Jeeyar Swami, Hanuman Chalisa Hyderabad, Hanumat Shakti Jagaran on November 29, 2010 by arisebharat.